Good for families on a tight budget. Bad for research development and innovation of alternative forms of energy that we’ll eventually need. I remember 15 years ago when experts talked about how rising fuel prices hurt businesses as costs increased for transportation, heating, etc. So why can’t the reverse be a benefit to the economy? Cheap gas is one of the greatest economy boosters we can have. It lowers the cost of other goods by making transportation cheaper, it encourages extra travel and tourism, and it increases consumer confidence and willingness to spend in the economy. 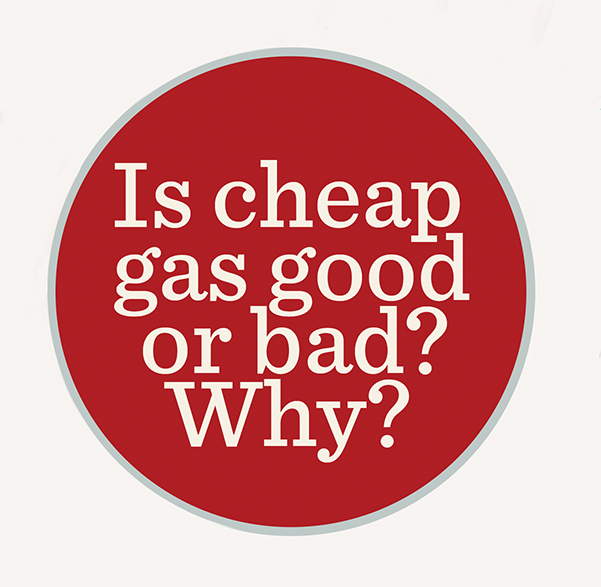 Cheap gas = more driving, with associated air quality and other impacts on the earth. We need to care for the earth and manage our resources wisely.